The Gospels are the perfect flower of Palestine. 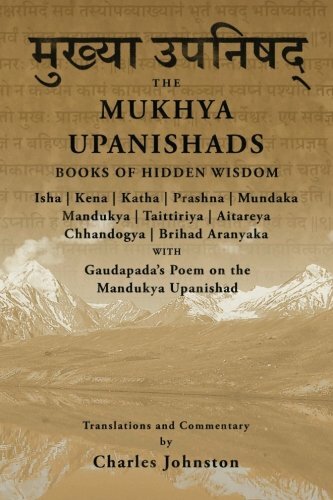 The Upanishads are the chiefest treasure of most ancient India. The heart of the Galilean message is hidden in the Parables of the Kingdom. The deepest secret of Mother India is embodied in those dramatic fragments and still perfect dramas which are the strongest part of the Upanishads. Of these Mystery plays there are many. The contest of Brahma and the Devas, king Death and Nachiketas, the Disciples of Pippalada, Bhrigu and Varuna, the Father of Shvetaketu, Uddalaka and the King, the Answers of Yajnavalkya, Indra and the Demon, and, greatest of all, the Dialogue of Janaka and the Sage, translated here. A modern paraphrase of the Teaching goes before it, yet, in all understanding of the Mystery, the Soul must be its own light. The secret of Life is whispered forever in our ears, summoning us to enter the hall of everlasting youth, bidding us unbar the door of our present divinity, pointing the path of unconquerable power, revealing to mortal man the secret of man the immortal. We are challenged to make true for ourselves the dreams we have dreamed of God. There is a newborn hope in the message of the unseen as it comes to us. We have passed out of the shadow into the sunshine. The clouds that hung so long about the door have lifted. The burden of the world’s anguish has melted away. Since the Cross first threw its black shadow along the earth, the promise of immortal life was held forth to those only who turned back in bitterness from the world, whose garb was sackcloth, their best hope despair. Their master was the Man of Sorrows. Their password was Renunciation. But we have left behind us the old evangel of pain. Our new watchword is Victory. Our genius is the lord of Joy. We are to renounce no longer but to conquer: to overcome the world not by flight but by possession. No longer exiles but victors shall knock at the immortal doors. The genius of our age has drawn very near to the secret. We have merged all ideals in one: to conquer, to be strong. Power and valor are our divinities. We no longer worship wealth but the will that wins it. Our one goal is the sense of success, and we see nothing but the goal. Even death we have almost forgotten, transforming the old king of terrors into a gentle and not unwelcome shadow. Nothing is remembered but the lust of strength. One step forward will change it to the lust of immortality. For a little experience of life is enough to teach us that in sensual success we miss our ideal. The sense of power slips past us into our works, leaving us poor and empty-handed. When in the very glow of victory we see the tinsel glitter fade, we are at the threshold of the unseen world; we are ready to understand that we were better than our goal, that we were born to more lasting triumphs. The time has come for us to claim our divinity. In the midst of our success, the finger of the hidden immortal touches us, and we are called forth from the arena of the world, to hear the whispered secret of our inheritance. The glamor of sensual life has fallen from our eyes, and we are ready to lift the black veil of death. When we draw back from life and sensual success, as something very good, yet not good enough to satisfy our heart’s desire, we come to a lull of quiet loneliness, a hush of silence in the dark. In that solitude and gloom we may catch the vision of the truer way, and surprise the world-old secret of human life. Hitherto we have lived believing ourselves closed in by the visible world, buried in the heart of sensual life, and held there firmly by our bodily fate. But we begin to divine that we are really set firm in the immortal power, leaning forward into sensual life from the life above it, never losing our firm foundation there. In the midst of death we are in life. Thus our destinies are passed between two worlds: the world of desire and death, and the world of will and immortality. When we learn to live from the will as we tried to live from sensual desires, we shall be already immortal, and enter living an immortal world. Therefore our worship of will brings us near to the portal of peace. This is the secret that shadows itself forth in the stillness and darkness. Soon will follow clearer vision that we have drawn our life from the world of the immortal, day by day since the beginning. But this simplest of all secrets was hidden from us by the seething of our desires. We and all creatures enter every day into the immortal world, though we know it not. Nor shall we remember, until the hush of stillness comes upon us when we draw back victorious yet disappointed from our battle with the material world. Not till we have renounced can our eyes open. Every day we wage our warfare with the world. Every night, when the throb of desire and the whirl of the senses grow still, we sink, as we call it, to sleep. We might more truly say we arise to our awakening. The shadows of our desires hover awhile around us, haunting us as we linger in the borderland of dreams. As our desires were, so are our dreams: things fair or hideous, grim or radiant with lovely light. But dreams soon fade and desires cease, and we enter into our rest. We pass from the world of the senses to the realm of immortal will. We enter in through the golden portal, far better than the fabled gates of ivory or horn, and for awhile we are immortal in power, immortal in peace. For without power there is no peace. Beyond the land of dreams and the shadows of desire stands the gate of peace. All men enter there and all creatures. Were it not so, all men must go mad. And within that portal, all are equal. All alike awake to their immortal selves. Sinner and saint have left their difference at the threshold. They enter in together as pure living souls. Weak and strong are one there, high and lowly are one. The immortal sunshine, the living water, are for all. For great Life has wrapt us around with beneficence, so that even now we are in the midst of the everlasting. Thus we all enter the power beyond the veil of dreams. We all draw our lives alike from the sea of life. In the radiance we are all one, wrapt in the terrible flame of Life. Yet we forget. We come back again shivering across the threshold, and hasten to wrap our pure divinity in a mist of dreams. The saint once more takes his white garment; the sinner, his red vesture of desire. The weak is weak again, and the strong exults. Their dreams are once more real to them; and these dreams are our mortal world. We return to the world of daylight to live for a few more hours in the strength brought back from the immortal world. Our earthen lamps are replenished for another watch. We strain and stagger under the burden of our dreams, driven by hope and fear, by desire and hate. Fear is the keenest scourge of all; making us cowards, it makes us also cruel. Thus we fall away from our divinity, robbed of every shred of memory by the army of shadows that meet us on the threshold, with their captain, fear. Yet in all our phantom-world, there is no illusion so absolute a lie as fear. We are the gods, the immortals; yet we cower and cringe. We are children of the will, yet slaves of fear. Therefore our ideal of valor brings us near the threshold, for it bids us kill the captain of the shadows who bar our way. But for a long time yet, the shadow of fear will lurk in the haunted darkness of our human hearts. Another day ends, and our tide ebbs. The storm of our desires has worn us out, and overcome with weariness, we sink to rest, we rise to power. And all our prayer and aspiration, all the fervor of our faith has no aim but this: to reach awake the sea of power we bathe in while asleep. Therefore we close our eyes in aspiration, seeking once again the light behind the veil. So great is the beneficence of sleep, so mighty a benison is ever near to us. We enter perpetually, but we always forget. Our power slips from us as we return through the cloud-zone of dreamland. Round every pillow gather thick the terrors and pains of life, not less than its ambitions and its hopes, instantly invading us as we come back to waking. Therefore we gain this clue to the secret. The door of our immortality is open to us day by day. But we are so ridden with dreams that our immortal heritage brings us no profit. Therefore we must elude the army of dreams. We must bring back to the light of day the present sense of our divinity which illumined us in dreamlessness. A thing so simple as that is the open door of our salvation. Our genius bids us gather power and conquer fear. And fear once mastered, we may begin to disband the army of dreams, the ghosts that haunt our borderland and make us forget. The diminished army on the frontier is no longer strong enough to keep us from smuggling through with us something of our dreamless vision, some memory of the immortal world. We glean these memories day by day, in the silence of the morning, in the first hush of waking, as we bring back into every morning something of the freshness of everlasting youth. At first, what we carry back with us will seem more dreamlike than dreams. Yet dreams have their power, as we should know whose whole lives are guided by dreams. First a dream-memory only: a haunting shimmer of other worlds; a secret freshness and gladness, coming we know not whence. Yet a vision so full of unearthly fascination and allurement that we would follow it rather than the solidest reality of day. Thus far all the poets have reached. This is the secret of their inspiration. They are haunted by the dreamless dream; it lingers in beauty over all their works. Even the faint memory of this vision is brightness enough to illumine hearts throughout all the world. Yet poets and the devout do not hold all the secret. They are still in the grayness of the morning. We are heirs to the full glory of the noonday sun. With fidelity and strong will we are to make real the fragments of our remembered dream, imposing them upon the shadows of the day, and in their light transforming all the world. The vision bursts from their hearts in a rapture of song and prayer, leaving their wills unenkindled. We are the richer, but they are the poorer. They should have sealed their lips, guarding the vision in their hearts till they had wrought it into the fabric of their lives. The highest valor is needed, to make our vision real. We must battle with the whole army of shadows, the princes and powers of the air. We must fight to the death, if we would inherit life. As the fight is waged with dauntless courage, we are ever more penetrated with the poignant intuition that our waking world is the real dream; the true waking is elsewhere, a better reality than this. Thus we begin to remember. Thus far the sages go. Their message is full of whispers that our life is a dream. But they go not far enough. They should pass on dauntless to the other shore, to the real world of their immortality. It lies about us in sleep. It is not far from us in our waking. Thus we gather the fruits that drift to us in the dawn from the other shore. There will come a time when that world begins to outshine this. Then we shall be ready for undimmed illumination. We shall really launch our boat upon the waves. Rapt from our mortal bodies into paradise, we shall hear words not lawful for mortal lips to utter, for the only lips that can tell of them are already immortal. No longer dimly overshadowed by the Soul, we enter through the silence into the very being of the Soul itself. We know with awe that we have inherited our immortality. We have found our treasure. With undimmed and boundless vision, we behold the shining ocean of life. The radiance and the realm are ours. We are filled full of infinite power, infinite peace. No longer heirs to the Power, we are the Power itself, in all its immeasurable divinity: the Power which is from the beginning, which shall outlive all ends. As we enter into the vision, there is silence: yet a silence full of immortal song. There is black darkness: yet darkness more radiant than any light. There is utter loneliness: yet the loneliness is full of living souls. The souls of the young-eyed immortals are there, who have gone before; and the blind souls of mortals who shall follow after. For we have entered the All: the infinite ocean of life, whose foam and bubbles are the world. It is a sudden revelation of the splendor of the living Soul. Then the mystic gloom closes upon us, and we return from our initiation, descending again to the waking world. As we draw near to waking, we see the whole of our life opened up before us like a landscape of sunshine and shadow. Sky meets earth behind us, where we entered. The earth rises up to the sky again in front of us, where we shall depart. We see spread out before us the country we are to pass through, with its hills and valleys leveled, as we view it from above; yet the whole road is clear to us, and no very formidable dangers await us or threaten to intercept us, ere we enter into our rest. For that one moment of our return, nothing is hidden from us of all the future; all things are present to the living soul. For a while, life sits very lightly on us. Our barque of fate is a painted ship on a painted ocean. We know which is the real world. Then the day-dream closes once more around us, and we are awake. Our vision fades; but not the memory of the vision. For we have rid our hearts of dream and shadow, so that they can hold the image of the light. We bring back the memory of the radiance, to guard it as the hidden treasure of our hearts. From henceforth, our task is this: with resolute valor to weave the brightness of that vision into all our lives. When we unseal the inner fountain of knowledge, its waters will never more cease to flow into our hearts, bringing life and light and everlasting youth. Many old and well-guarded secrets will come to us and reveal themselves in the twilight stillness. Deathlessness we know to be ours; and gradually the mists begin to lift from the infinite army of years we have lived, from the endless days that are to come. By entering the Soul, we have lifted ourselves above the narrow walls of this one life, and it no more tyrannizes over us with loud insistence as before. Fragments of long-forgotten days drift back to us, with names and scenes of other lands left long ago, when we passed away from them through the gates of death. They come very near to us, these memories of dead years; closer and more vivid than scenes of yesterday. We find old faces of new friends, very familiar kindred under names and forms that our common past had buried, yet never so deep but that they rise again. This one life of our mortality takes its place in the undivided Life, ranged with the days that are vanished yet still here, with the days that are not, yet already are. The tangled skein of fate begins to unravel, and we see more clearly where and why we failed. The sins and sorrows of our life take their true color, in the awful light of the all-seeing Soul. One thing we learn that unveils many mysteries, and shows us the seed of all human pain: we lived hitherto, and all who have not passed through the darkness still live, under the despotism of a tyrant, a false and demoniac self whom they take to be themselves. Possession by devils is no myth. You can see them recording themselves in human faces, everywhere throughout the world. Every self that believes itself separate is a devil, haunted by a curse of loneliness, and living only to flee from its pursuing doom. The horror of solitude brings the lust of sensation, and desire of sensation dominates all human life. It dominates even death, for death is at once the punishment of sensual life, and the palliative which shall enable sensual life to be renewed. Everyone carries the hungering and thirsting demon with him, and lives his life at his bidding, and we also have hitherto done the same. Yet such is Life’s beneficence, that from every storm-tossed heart there gleams to us a starry ray of the Soul. The usurping self came between us and our peace. It came between us and our work, claiming incessantly that all things should be done not for the divine idea in them but in order to pay tribute to the lusts of the demoniac self. This grasping of self after a reward foiled all our best efforts, dragging all we did awry, and cursing us with perpetual impotence. We are now to learn what true work is, untainted by the usurper’s touch. For the mission of the Soul is work. The Soul is no exile shivering on the verge of space, at home only in some pale heaven, but the lord who made the worlds, full of tremendous power, and ready to transmit it through our wills. We are to handle all the force and substance of our lives, holding nothing too gross or trivial; to transform all, no longer guiding ourselves by hearsay or tradition, but working through the instant intuition of the Soul. For each of us, there is a peculiar task or art or handicraft, something we can do with surpassing pleasure and power. The Soul is to work in us through that task first, writing its revelation in our work. And the highest inspirations in the world are embodied in the shapes of stone, or colored earths on canvas, or mere black on white, so responsive are even these inert things to the enkindling presence. Beginning with stones and earth, we are to transform all things in that light, ending only at the threshold of divinity itself, which transforms us. It is a common shadow of fear that the present Soul will weaken our hold of human life, and leave us at the mercy of fate. And this dread has kept many back, who longed to lift the veil. Yet it is sheer superstition. Only the immortal can master human life and defy fate. Only those who reinforce themselves through the Power can handle even the weakest forces firmly, with a will as irresistible as nature’s might. For will is the key to all nature’s power, and in the fullness of time we shall unlock all her secrets, learning how she made the rocks and rivers, the stars and the ever-moving sea. We divine already that there is a way of touching force direct, with the will; and not mediately as we do, through reason and thought acting on substance, which is embodied force. In the days to come, we are to create. But at the outset, we must learn through our individual task, the one thing we can do best, the work that strikes from us a flash of genius, a fire whose secret is with us alone. All men are heirs to genius, to the personal revelation which shall set the stamp of original power on all they do. But they must claim their inheritance. This is the key of half the perplexities of life. We are altogether wrong, we are divided into rich and poor, blest and unblest, because men copy instead of learning to create each according to his genius. As they copy, they become mere grains of human sand, mere ants in the human ant-hill, and there is small demand for what they do, small virtue or joy in it, and small reward. But let all men become creative, and the work of each will become indispensable to all and rewarded by all; for a pure and original fire will be in it, as little to be imitated as the fire in the ruby’s heart, or the different glory of the stars. We imitate because we are caught in the panic of life, and bitten with the craving for possessions to shield us against our weakness and against fate. We are smitten with the lust of sensation, and hurry to gratify it. But we only defeat our heart’s desire, for what sensation can vie with the glow and the strength that are in us, while we create? In the one case we try to buttress our strength from the ebbing sensual world; in the other, we draw into ourselves the strength of the everlasting. If it is power we seek, and keen delight, here is the true way to find it. Every sensual stimulus leaves us weakened and nearer to death. Every act of creative will makes us stronger and brings us nearer to immortal life. In the panic pursuit of sensation, and of protection against fate, each man’s demon urges him, with terror-stricken whispers, to struggle against all other men. Of ten parts of human power, nine are consumed in this struggle, where each undoes the other’s work, all pulling different ways, and neutralizing each other’s strength. Yet the one part which remains is enough to do all the work of the world. Judge then what lavish excess of power we shall have, when we no longer thwart but strengthen each other’s wills. The demons in us fight against each other like demons. But the genius in each can no more hinder the genius in another than sunbeams can clash, in the blue sea of the ether. What each man’s genius is, will be whispered to him in the silence, when he has found his way back to the omnipotent Soul. Thenceforward, the genius will work in him, handling all things in life in a new and masterly way. The perfect poet and artist, the hero and saint, differ in this only from other men: that they obey the genius of valor and beauty who stands above them, yielding up the reins to their divinity and offering their wills as workers for the light. As there is something creative and unprecedented in the life of every saint and hero, in the work of every true poet and master of beauty, so it should be with us all. Our lives should be every moment creative, bearing in all their works that power and light which are the sign manual of our divinity. And from the Soul will come the measure of our reward, full, pressed down, flowing over. We can draw on that lavish measure of reward for our work, as soon as we renounce the lust of reward. For that lust pulls all our work awry, and hinders the true reaction towards us, which is designed and purposed by the Soul. As the will and inspiration of our true work come from the Soul, so does our true reward, by an infallible law; coming to us from the outer and natural world, where the same Soul creatively works, with the certainty of harvest after seed-time; and the Soul’s measure of reward is ten times greater than ours. That reward we may reap, from the moment that we begin to do true work, inwardly from ourselves, instead of aping the energies of others. Our lives must be rebuilt on lines conformed to our present immortality, our inheritance from the sea of life. We have drawn the plan, and carried out the building, forgetting the genius who over-shadows us. We had built for a mortal. We suddenly find the measure of the dwelling too strait for the immortal. We must learn to build anew, in the light that glows beyond the heavens. This is what the tide brings us, from the sea of Life, concerning our work, and work is the essence of the Soul. Yet all this is as nothing, compared with the unveiling which awaits us, when we come with new eyes to look on human life. If the fear-self thwarted us with nature, ten times more did it thwart us with man. Mortal has never understood the simplest heart of mortal, nor ever shall. Only the immortal in us can do that. For in every heart there are immortal gleams, and only their like can comprehend them. What lies before us is a vivid and inward realization of other lives, those nearest to us at first, then the more remote; a vision as piercing and intimate as the love we once bore ourselves. All men shall be to us as our own souls, and our whole aim will be, to let the great Soul do its work in them, as in us, for they are our other selves. In the splendid hour of illumination, we were alone in the silence and darkness of the immortal world. Yet not alone, for the inmost holy of holies was full of the souls of men. In that dread presence all are one, and that one the Soul. We bring that memory back, our first intuition of human life, coming to us only with our immortality. Thenceforth, we need not go abroad to find our other selves. They come to us, pressing closely round our souls, in vision or in blindness, in sadness or mirth, in love or hate. But above love or hate or sorrow is the immemorial essence of our common Soul, the holy presence of the all- penetrating Life. We must bow to it and obey it in every relation of our lives, dealing with the immortal in mortals, answering the powers and needs of the soul alone. Mortals are at strife, but the immortals in them never. All move in the one Light. Each strengthens and fulfills the other. From the day of our vision, we shall learn to find the immortal in everyone; with that divinity alone our work lies. We must seek for each what his own genius seeks. In building our lives on immortal lines, we have thrown away the burden of anxious scheming, laying the responsibility of our success on the genius within, the genius who cannot fail, for his light is drawn from the infinite Light. Thus we ease our hearts of a weight they have carried for ages, thereby tasting the first fruits of liberty and peace. For in the will of the genius we are free. So when we deal no longer with mortals for ever at strife, but with the immortals above them who are full of peace, we find another lightening of our load, another mighty secret of power and joy. For one of the bitterest things in our lives, though we never knew it, was the perpetually foiled longing to constrain others to do our bidding, to see with our eyes, to act not from their own wills but from ours. This desire is the hotbed of hate. And hate is twice cursed, in the victim and in the tyrant. We have been for ages full of its two- edged wounds. But hate shall cease from henceforth for evermore. We shall no longer seek to constrain anyone to do our bidding. It is not our bidding that needs to be done, but the bidding of the genius in each, the wise divinity within the other’s heart. When we surrender our wilfulness and bow to the light in another, we draw forth wonder and willing help. The lord of his inmost fortress sees in us a friend, all doors are opened to us, and we are made free of every secret within. To discover by subtlest intuition the word of the genius to our other selves, and, in all dealing with them, to second the will of the radiance even against their mortal wills, is our second task, as the rebuilding of our lives after the immortal ground plan was the first. By following it in faith and valor, we inherit boundless power amongst men, for in all there is the power who fights for us, whether they be friends or enemies of our mortal selves. The third task of our immortality is yet greater: hardly to be spoken of, yet not to be passed over in silence. We are to perfect our oneness with the Soul, to break down all barriers, to draw into our wills the powers of the Most High, not for our own purposes, but for everlasting ends; to draw ever towards the Light, not for guidance along our pathway, but for the Light. We are to find the way to the immortal sea, for thither are we to return. For when the last word is said, we are finally concerned, not with the works of our wills, nor with our other selves, but with the Soul that gives to them their life. Our lives and our other selves concern us because they are of the Soul. But there is something greater and more August than these sunbeams of the Soul, however radiant they are and lovely. There is the Soul itself, the infinite, undivided Life. Thither at last shall our footsteps tend. Thither when our works are done, when we have come to perfect oneness with our other selves, so that the radiance flows unimpeded through us all: thither shall we enter in, losing ourselves and them and all things, to find them again in the infinite Soul. Brihad Aranyaka Upanishad: IV, 3-4. Yajnavalkya, what is the light of the Spirit of man? The sun is his light, O king; he answered. With the sun as his light he rests, goes forth, does his work, and returns. This is so in truth, Yajnavalkya. But when the sun is set, Yajnavalkya, what is then the light of the Spirit of man? The moon then becomes his light; he answered. With the moon as his light he rests, goes forth, does his work, and returns. This is so in truth, Yajnavalkya. But when the sun is set, Yajnavalkya, and the moon is also set, what is then the light of the Spirit of man? Fire then becomes his light, he answered. With fire as his light he rests, goes forth, does his work, and returns. This is so in truth, Yajnavalkya. But when the sun is set, Yajnavalkya, and the moon is also set, and the fire sinks down, what is then the light of the Spirit of man? Voice then becomes his light; he answered. With voice as his light he rests, goes forth, does his work, and returns. Therefore in truth, O king, when a man cannot distinguish even his own hand, where a voice sounds, thither he approaches. This is so in truth, Yajnavalkya. But when the sun is set, Yajnavalkya, and the moon is also set, and the fire sinks down, and the voice is stilled, what is then the light of the Spirit of man? The Soul then becomes his light, he answered. With the Soul as his light he rests, goes forth, does his work, and returns. It is the Consciousness in the life-powers. It is the Light within the heart. This Spirit of man wanders through both worlds, yet remains unchanged. He seems only to be wrapt in imaginings. He seems only to revel in delights. When he enters into rest, the Spirit of man rises above this world and all things subject to death. For when the Spirit of man comes to birth and enters a body, he goes forth entangled in evils. But rising up at death, he puts all evils away. The Spirit of man has two dwelling-places: both this world, and the other world. The borderland between them is the third, the land of dreams. While he lingers in the borderland, the Spirit of man beholds both his dwellings: both this world and the other world. And according as his advance is in the other world, gaining that advance the Spirit of man sees evils or delights. When the Spirit of man enters into rest, drawing his material from this all-containing world, felling the wood himself and himself building the dwelling, the Spirit of man enters into dream, through his own shining, through his own light. Thus does the Spirit of man become his own light. There are no chariots there, nor steeds for chariots, nor roadways. The Spirit of man makes himself chariots, steeds for chariots and roadways. Nor are any delights there, nor joys and rejoicings. The Spirit of man makes for himself delights and joys and rejoicings. There are no lotus ponds there, nor lakes and rivers. The Spirit of man makes for himself lotus ponds, lakes and rivers. For the Spirit of man is Creator. Leaving the bodily world through the door of dream, the sleepless Spirit views the sleeping powers. Then clothed in radiance, returns to his own home, the gold-gleaming Genius, swan of everlasting. Guarding the nest beneath through the life-breath, the Spirit of man rises immortal above the nest. He soars immortal according to his desire, the gold-gleaming Genius, swan of everlasting. Soaring upward and downward in dreamland, the god makes manifold forms; now laughing and rejoicing with fair beauties, now beholding terrible things. They see his pleasure-ground, but him sees no one. Thus goes the saying: Let none awake him that sleeps; for he is hard to heal, if the soul returns not to him. They also say that dream is a province of waking. For whatever he sees while awake, the same he sees in dream. Thus the Spirit of man becomes his own light. And when he has taken his ease in the resting-place of dream, moving to and fro and beholding good and evil, the Spirit of man returns again by the same path, hurrying back to his former dwelling-place in the world of waking. But whatever the Spirit of man may behold there, returns not after him, for the Spirit of man is free, and nought adheres to the Spirit. This is so in truth, Yajnavalkya. I give a thousand cattle to the teacher. But tell me the higher wisdom that makes for liberation. And when he has taken his pleasure in the waking world, moving to and fro and beholding good and evil, the Spirit of man returns again by the same path, hurrying back to dreamland. As a great fish swims along one bank of the river, and then along the other bank, first the eastern bank, and then the western, so the Spirit of man moves through both worlds, the waking world and the dream world. Then as a falcon or an eagle, flying to and fro in the open sky and growing weary, folds his wings and sinks to rest, so of a truth the Spirit of man hastens to that world where, finding rest, he desires no desire and dreams no dream. And whatever he has dreamed, as that he was slain or oppressed, crushed by an elephant or fallen into an abyss, or whatever fear he beheld in the waking world, he knows now that it was from unwisdom. Like a god, like a king, he knows he is the All. This is his highest world. This is his highest joy. He has passed beyond all evil. This is his fearless form. And as one who is wrapt in the arms of the beloved, knows nought of what is without or within, so the Spirit of man wrapt round by the Soul of Inspiration, knows nought of what is without or within. This is his perfect being. He has won his desire. The Soul is his desire. He is beyond desire. He has left sorrow behind. Here the father is father no more; nor the mother a mother; nor the worlds, worlds; here the scriptures are no longer scriptures; the thief is a thief no more; nor the murderer a murderer; nor the outcast an outcast; nor the baseborn, baseborn; the pilgrim is a pilgrim no longer, nor the saint a saint. For the Spirit of man is not followed by good, he is not followed by evil. For he has crossed over all the sorrows of the heart. The Spirit sees not; yet seeing not, he sees. For the energy that dwelt in sight cannot cease, because it is everlasting. But there is no other besides the Spirit, or separate from him, for him to see. The Spirit smells not; yet smelling not, he smells. For the energy that dwelt in the power of smell cannot cease, because it is everlasting. But there is nothing else besides the Spirit, or separate from him, for him to smell. The Spirit tastes not; yet tasting not, he tastes. For the energy that dwelt in taste cannot cease, because it is everlasting. But there is nothing else besides the Spirit, or separate from him, for him to taste. The Spirit speaks not; yet speaking not, he speaks. For the energy that dwelt in speech cannot cease, because it is everlasting. But there is nothing else besides the Spirit, or separate from him, for him to speak to. The Spirit hears not; yet hearing not, he hears. For the energy that dwelt in hearing cannot cease, because it is everlasting. But there nothing else besides the Spirit, or separate from him, for him to hear. The Spirit thinks not; yet thinking not, he thinks. For the energy that dwelt in thinking cannot cease, because it is everlasting. But there is nothing else besides the Spirit, or separate from him, for him to think of. The Spirit touches not; yet touching not, he touches. For the energy that dwelt in touch cannot cease, because it is everlasting. But there is nothing else besides the Spirit, or separate from him, for him to touch. The Spirit knows not; yet knowing not, he knows. For the energy that dwelt in knowing cannot cease, because it is everlasting. But there is nothing else besides the Spirit, or separate from him, for him to know. For only where there is separation may one see another, may one taste another, may one speak to another, may one hear another, may one think of another, may one touch another, may one know another. But the one Seer is undivided, like pure water. This, O king, is the world of the Eternal. This is the highest path. This is the highest treasure. This is the highest world. This is the highest bliss. All beings live on the fragments of this bliss. He who amongst men is rich and happy, a lord well endowed with all wealth, this is the highest bliss of mankind. But a hundredfold greater than the bliss of man is the bliss of the departed who have won paradise. A hundredfold greater than the bliss of the departed who have won paradise is the bliss of the world of seraphs. A hundredfold greater than the bliss of the world of seraphs is the bliss of the gods grown divine through righteousness. A hundredfold greater than the bliss of the gods grown divine through righteousness is the bliss of the gods divine by birth, and of him who has heard, who has risen from darkness, who is not stricken by desire. A hundredfold greater than the bliss of the gods divine by birth is the bliss of the world of the creators, and of him who has heard, who has risen from darkness, who is not stricken by desire. A hundredfold greater than the bliss of the world of the creators is the bliss of the world of the Eternal, and of him who has heard, who has risen from darkness, who is not stricken by desire. This is the highest bliss. This, O king, is the world of the Eternal. And he replied: I give the teacher a thousand cattle. But tell me the higher wisdom that makes for liberation. And Yajnavalkya feared, thinking: the wise king has cut me off from all retreat. And when he has taken his pleasure in dreamland, moving to and fro and beholding good and evil, the Spirit of man returns again by the same path, hurrying back to his former dwelling-place in the world of waking. Then as a wagon heavy-laden might go halting and creaking, so the embodied soul goes halting, overburdened by the Soul of Inspiration when it has gone so far that a man is giving up the ghost. When he falls into weakness, whether it be through old-age or sickness he falls into weakness, then like as a mango or the fruit of the wave-leafed fig or of the holy fig-tree is loosened from its stem, so the Spirit of man is loosed from these bodily members, and returns again by the same pathway to its former dwelling-place in the Life. Then like as when the king is coming forth, the nobles, officers, charioteers and magistrates make ready to serve him with food and drink and shelter, saying: the king is coming forth, the king is at hand; so all the powers make ready to wait on the soul, saying: the soul is coming forth, the soul is at hand. And like as when the king will go forth, the nobles, officers, charioteers and magistrates gather about him; so verily at the time of the end all the life-powers gather round the soul, when it has gone so far that a man is giving up the ghost. When he falls into a swoon, as though he had lost his senses, the life-powers are gathering in round the soul; and the soul, taking them up together in their radiant substance, enters with them into the inner heart. When the power that dwells in sight is sent forwards and outwards, he beholds the visible world; but now the powers are merged into one, and they say: he no longer sees. His powers are merged into one, and they say: he no longer smells. His powers are merged into one, and they say: he no longer tastes. His powers are merged into one, and they say: he no longer speaks. His powers are merged into one, and they say: he no longer hears. His powers are merged into one, and they say: he no longer thinks. His powers are merged into one, and they say: he no longer touches. His powers are merged into one, and they say: he no longer knows. As a worker in gold, taking an ornament, molds it to another form newer and fairer; so in truth the soul, leaving the body here, and putting off unwisdom, makes for itself another form newer and fairer: a form like the forms of departed souls, or of the seraphs, or of the gods, or of the creators, or of the Eternal, or of other beings. The soul of man is the Eternal. It is made of consciousness, it is made of feeling, it is made of life, it is made of vision, is it made of hearing; it is made of the earth, it is made of the waters, it is made of the air, it is made of the ether, it is made of the radiance and what is beyond the radiance; it is made of desire and what is beyond desire, it is made of wrath and what is beyond wrath, it is made of the law and what is beyond the law; it is made of the All. The soul is made of this world. and of the other world. According as were his works and walk in life, so he becomes. He that does righteously becomes righteous. He that does evil becomes evil. He becomes holy through holy works and evil through evil. As they said of old: Man verily is formed of desire, as his desire is, so is his will; as his will is, so he works; and whatever work he does, in the likeness of it he grows. Through his past works he shall return once more to birth, entering whatever form his heart is set on. When he has received full measure of reward in paradise for the works he did, from that world he returns again to this, the world of works. Thus far of him who is under desire. Now as to him who is free from desire, who is beyond desire, who has gained his desire, for whom the Soul is his desire. From him the life-powers do not depart. Growing one with the Eternal, he enters into the Eternal. And like as the slough of a snake lies lifeless, cast forth upon an ant-hill, so lies his body, when the Spirit of man rises up bodiless and immortal, as the Life, as the Eternal, as the Radiance. I give a thousand cattle to the teacher: thus spoke Janaka king of the Videhas. The small old path that stretches far away, has been found and followed by me. By it go the Seers who know the Eternal, rising up from this world to the heavenly world. It is adorned with white and blue, orange and gold and red. This is the path of the Eternal, the path of the saints, the sages, the seers in their radiance. Blind darkness they enter who worship unwisdom. They go, as it were, to greater darkness who exult in wisdom. Joyless verily are those worlds, by blind darkness hid—thither at death go those who have not found wisdom, whose souls have not awakened to the light. Who knows the Soul, and see himself as it—what should he long for, or desiring what should he fret for the fever of life? By whom the awakened Soul is known while he dwells in the wilderness of the world, he is creator of all and maker of all; his is the world, for he is the world. Even here in the world have we reached wisdom; without wisdom, great were thy loss. They who are illumined, become immortal. Others enter into sorrow. When a man gains the vision of the godlike Soul, the lord of what has been and what shall be, he fears no more. At whose feet rolls the circling year with all its days, him the gods worship as the one, the light of lights, the immortal life. In whom the five hierarchies of being and the ether are set firm, him I know to be the Soul. And knowing that deathless Eternal, I too am immortal. They who know the life of life, eye of the eye, the ear’s ear, heart of the heart, have found that eternal Ancient, the Most High. This is to be understood by the heart: there is no separateness at all. He goes from death to death who beholds separateness. This immeasurable and unchanging Being is to be beheld as the One. The stainless Soul is higher than the heavens, mighty and sure. Let the sage, the follower of the Eternal, knowing this, strive to behold it in vision. Let him not meditate on many words, for words are weariness. This is the mighty Soul unborn, who is Consciousness among the life-powers. This is the heaven in the heart within, where rests the ruler of all, master of all, lord of all. He grows not greater through good works, nor less through evil. He is lord of all, overlord of beings, shepherd of all beings. He is the bridge that holds the worlds apart, lest they should flow together. This is he whom the followers of the Eternal seek to know through their scriptures, sacrifices, gifts and penances, through ceasing from evil towards others. He who knows this becomes a sage. This is the goal in search of which pilgrims go forth on pilgrimages. Knowing Him, the men of old desired not offspring. What should we do with offspring, they said, since ours is the Soul, the All? They became saints, ceasing from the desire of offspring, the desire of the world, the desire of wealth. For the desire of offspring is a desire for wealth, and the desire of wealth is a desire for the world. For these are both desires. But the Soul is not that, not that. It is incomprehensible, for it cannot be comprehended; it is imperishable, for it passes not away; nought adheres to it, for it is free; the Soul is not bound, fears not, suffers not. For to him who knows, neither crosses over—the evil he does nor the good. He passes both; things done or undone afflict him not. This is the lasting might of him who knows the Eternal, that he grows not greater nor less through deeds. Let him find the pathway of the Soul. Finding it, he is not stained by evil. He who knows is therefore full of peace, lord of himself; he has ceased from false gods, he is full of endurance, he intends his will. In his soul he beholds the Soul. He beholds all things in the Soul. Nor does evil reach him; he passes all evil. He is free from evil, free from stain, free from doubt, a knower of the Eternal. This is the world of the Eternal, O king. Thus spoke Yajnavalkya. I give the Master my Videhas and myself also as thy servant; said the king. This mighty Soul unborn is the eater of the food of all life. The Soul is the giver of treasure. He finds the treasure, who knows this. This mighty Soul unborn grows not old, nor dies, for the Soul is immortal and fearless. The Soul is the fearless Eternal. He grows one with the Eternal, the fearless Eternal, who knows this.